Roll On aims to share the everyday lives of families living with neuromuscular disorders with caseworkers and clinicians, and the parents of children who have been recently diagnosed that they are working with. It does this in order to help them gain a new perspective on living with these disabilities. Candidly, and with maturity rare in young people, the children—between the ages of six and eighteen—share stories of bullying at school and the feelings of rejection it can cause in some children. They explain common misconceptions the able bodied community has of people with neuromuscular disabilities, and how sympathy from able bodied people may lead the disabled to feelings of victimization—a complete mischaracterization of themselves as thriving, productive individuals. The parents featured in the video discuss what it was like to first hear from a doctor that your child will never walk or talk, and then feeling the need to treat your child like he or she does not have an illness. Parents share advice on how to handle inclusion in and outside of the classroom, as well as how to approach and work with parents when accommodations are needed for events like sleepovers and birthday parties. 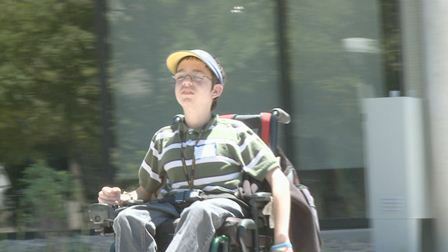 Roll On acknowledges the reality that life can be difficult, whether it is fighting a health care system that seems to be working against you, or facing feelings of isolation, anger, or even suicide that can plague a child with disabilities. But from diagnosis to life expectations, the parents and children featured in Roll On candidly share their experiences and advice on how to seek help and succeed and how to celebrate the blessings on their unique path in life. Boy In The World: Following four-year-old Ronen, a young boy with Down syndrome, this intimate documentary concretely demonstrates that inclusive preschool classrooms benefit both children with special needs and their typical peers. It examines the nuts and bolts of successful inclusion as well as the challenges of educational practices that help all children to learn  and to find their place in the world. Ten Commandments of Communicating With People With Disabilities: This top selling video is used to train staff and community about disability etiquette. More Than Horseplay: Explores the intersection of therapy and research, while offering a joyous look at the experiences of three children with cerebral palsy as they grow in self-confidence and physical capability through participation in "hippotherapy," a form of physiotherapy involving horseback riding. Kiss My Wheels: Through an exhilarating season of training and competition, the members of a junior wheelchair basketball team deal with difficult issues, from gender conflicts to injury, illness, and thoughts of death.